The NFL is a passing league and you need look no further than Peyton Manning’s annihilation of every pass record imaginable to know that wide receivers are on the verge of passing running backs as the most valuable assets in fantasy. In the past starting your draft WR-WR in the first two rounds was unheard of but in 2014 there is an elite tier of receivers who are incredibly reliable and if you have a mid to late draft slot, I’d be looking there in my drafts. As deep as receivers are this year I’m seeing a sizable drop off after the top 10, so I definitely want at least one top receiver early in all of my drafts. If you missed any of this year’s position by position rankings, you can view a complete list of all of the 2014 draft rankings here. Now on to the wide receiver rankings for 2014! Who Are The Top Fantasy Wide Receivers of 2014? 1. Demaryius Thomas, Denver Broncos – Down goes Calvin! Down goes Calvin! 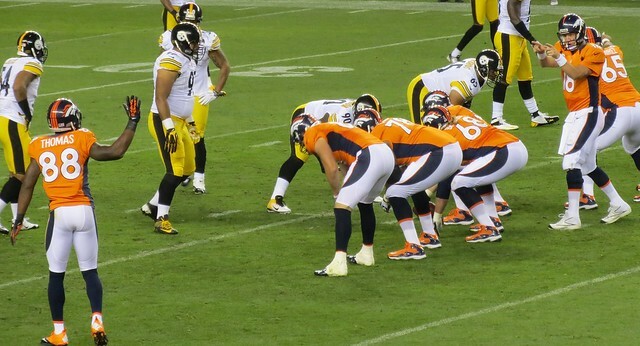 Playing in the league’s best offense, with the league’s best quarterback, Demaryius finished fourth in yards and first in touchdowns amongst receivers, despite being targeted only the 13th most times in the league. Without Eric Decker on the team, Manning will look Thomas’ way more than ever and his outstanding surrounding cast will prevent defenses from taking him away. Last season Thomas averaged 10 yards per target on just 143 balls thrown his way. If he gets in to the 180-target range (a very real possibility in Decker’s absence), we’re talking about a 115 catch, 1,800-yard, 18-touchdown receiver. Scarily, it’s possible we haven’t seen the best that Thomas has to offer yet. 2. Calvin Johnson, Detroit Lions – It was hard for me to rank Calvin as the #2 receiver coming off three straight 1,400 yard seasons, but there are a few red flags that give me concern. For the last three seasons, he has battled some knee, ankle and foot injuries and while he was able to play through most of them (he missed 2 games last year), I’m worried they will catch up to him eventually, especially since he plays at least half his games on the Ford Field turf. Injury concerns aside, Calvin is as dominant a receiver as the league has ever seen, and he has a pass happy gunslinger throwing him the ball. He’s a stud and I certainly wouldn’t blame anyone for taking him as the first receiver off the board, but feet to the fire I’m taking Demaryius instead. 3. A.J. Green, Cincinnati Bengals – Coming off back-to-back 1,300+ yard, 11 TD seasons, there should be no doubt why Green is being drafted in the top seven overall on draft day. In terms of physical ability there are very few receivers in the league who can match him and while his 2014 stats were incredible, I do wonder if he’s reached his ceiling, at least with Andy Dalton under center. Green was the second most targeted receiver in the league with Dalton looking his way on over 30% of his pass attempts. There is talk out of the Bengals camp that the team is looking to run more and pass less this season, so there is a chance Green’s numbers might regress a bit in 2014. Regardless AJ Green is a stud WR1 and makes an excellent cornerstone for your fantasy franchise. 4. Julio Jones, Atlanta Falcons – If Julio didn’t break his foot in week 5, I have no doubts he would have been the #1 receiver in fantasy this year. Through the first five games of the season, he was on pace for 131 receptions and over 1,800 yards. But Julio did break his foot (the same injury he suffered before the combine in 2011) and now there’s concern about his availability to start the year. Although he’s not participating in off-season workouts, he appears to be on track for week 1 so we’ll monitor his progress and adjust his ranking accordingly. Julio is an elite talent and could claim the top spot by year-end, but he doesn’t come without risk. As long as the news stays positive I’d have no problem drafting him in the late first, early second rounds. 5. Dez Bryant, Dallas Cowboys – Coming off back to back 1,200+ yard seasons with double digit touchdowns, Bryant is an elite receiver right there with the Demaryius, Calvin group, but the only hesitation I have on him is that his week to week production can be very inconsistent at times. In 2013 he had four games of 9 or less fantasy points, and in 2012 he had three games of 5 or less fantasy points. I’m nit picking of course, but in this tier I have to separate somehow. Plus, the flipped side of that is that he’ll have monster games will win you your fantasy week, but you just hope his off-weeks don’t come during the fantasy playoffs. I anticipate the Cowboys having a lot of shootouts this season, and there is good reason to believe Dez has another level in him. Dez is an extremely talented receiver, in a very pass heavy Cowboys offense and makes an excellent WR1 in all formats. 6. Brandon Marshall, Chicago Bears – Coming off a 118 catch, 1,500 yard season, Marshall himself wasn’t happy with his “down year” in 2013, but when your down year is 1,295 and 12 touchdowns on 100 grabs, sign me up. Marshall is on the wrong side of 30 and breakout receiver Alshon Jeffery is pushing him for receptions, but the Bears offense is one of the league’s elite and there’s plenty of passes to go around. The Bears signed him to a 3-year extension this off-season, so apparently they’re not too concerned about his age and I’m not either. Like with Dez there will be some weeks where Jeffery gets all the targets, and Marshall comes up small, but his mid second round ADP makes that more palatable. Marshall is a stud and makes a great anchor for your receiving corps. 7. Jordy Nelson, Green Bay Packers – Before Aaron Rodgers went down in week 9, Nelson was the 6th best receiver in fantasy and on his way to a career year. He still finished with career highs in receptions (85) and yards (1,314) despite playing with three of the worst quarterbacks in the NFL for half of the year. With a healthy Rodgers back in the fold I’m expecting big things from the Nelson and the rest of the Packers offense. The return of Randall Cobb will also help keep defenses from taking Nelson away like they did last season. Nelson is by far my favorite wide receiver value this season (late 2nd / early 3rd ADP) and I’d be very happy to roster him as my WR1 on all of my teams. 8. Alshon Jeffery, Chicago Bears – After an underwhelming rookie year, Jeffery spent the off-season working out with teammate Brandon Marshall and came back with a vengeance, exploding on to the scene with 89 receptions and 1,500+ total yards. There’s always some risk in paying top dollar for players coming off a breakout year, but Jeffery is a big time talent and that offense is legit. Like Marshall, Jeffery will have weeks where the other guy gets targeted more often, but both Marshall and Jeffery will see plenty of targets and there should be enough yards and touchdowns to keep both of them (and their fantasy owners) happy. 9. Randall Cobb, Green Bay Packers – Coming in to 2013, Cobb looked prime for a breakout season, but a fractured tibia suffered in week 5 cost him ten games. Cobb is a PPR monster, catching nearly everything thrown his way. In 2012 he led all receivers in catch % for players with at least 100 targets, catching an astounding 77% of passes thrown his way. Even with the crowded receiving corps in Green Bay, it won’t take a ton of targets for Cobb to catch 100 balls, and with Aaron Rodgers under center he has a good chance to lead the league in receptions. Cobb is a WR1 in most formats, but is an extra special player in PPR formats. 10. Antonio Brown, Pittsburgh Steelers – To say Brown had a career year is an understatement. He destroyed his career highs in every category catching 110 balls for 1,499 yards and 8 touchdowns (his previous highs were 69 rec, 1,108 yards and 5 touchdowns). Although I like Brown as a receiver I’m not paying top dollar because I’m skeptical that he can repeat numbers like this. Despite his breakout season, he might still fly under some radars and if I can get him as my second receiver I’d take him all day, but on average he’s being drafted in the late second round which is way too high for my taste. If he drops, grab him, but at his current draft price I would be happy to let someone else have him. 11. Vincent Jackson, Tampa Bay Buccaneers – In spite of some pretty brutal quarterback play, V-Jax posted his second best season as a pro hauling in a career high 78 passes for 1,224 yards and 7 TDs. Josh McCown takes over under center in 2014, and while he’s not exactly Peyton Manning, he’s light years ahead of what they rolled out at quarterback last season. In Chicago McCown proved what he could do throwing to big receivers in Marshall and Jeffery, and he’s a good bet to repeat the feat with Jackson and rookie Mike Evans. The knock on V-Jax is that there are some weeks where he disappears against tough defenses (4 fantasy points vs. Arizona and 3 fantasy points vs. Seattle) but his ability to catch touchdowns gives him a high floor. Ideally I’d like to have Jackson as a high end WR2, but I have no problem with him as a WR1 if you loaded up elsewhere. 12. Pierre Garcon, Washington Redskins – Garcon was the most targeted receiver in the league last season (184 targets) and shattered his career highs in receptions (113) and yards (1,346), but he only found the end zone 5 times and that held his fantasy points down. Coming in to 2014 the Redskins have a new coach who likes to pass, a healthy RG3 and DeSean Jackson on the other side to keep defenses honest, so an uptick in Garcon’s numbers is very much possible. If Garcon can find the end zone just a little more often he could jump in to the next tier of receivers. Although he has an ADP of the mid-third round, I’ve seen him fall much later in mock drafts. If he drops in your draft, be ready to pounce. 13. Keenan Allen, San Diego Chargers – A Danario Alexander knee injury opened the door for Allen to start for the Chargers and he never looked back leading all rookie receivers in receptions, yards and touchdowns. The Chargers offense was surprisingly efficient after a few down seasons, and Phillip Rivers was not afraid to look the rookie’s way, with Allen accounting for nearly 20% of his completions as a starter. There is some health risk with Allen, a knee injury caused him to fall to the third round in the 2013 draft, and he will likely see a lot more coverage from opposing defenses, but he’s a player on the rise and makes an excellent WR2 in fantasy leagues. 14. Andre Johnson, Houston Texans – In 2013 Johnson was one of the Texans’ lone bright spots in a season to otherwise forget. Unfortunately for Houston, 2014 has gotten off to an even rockier start with Johnson holding out of all off-season workouts and demanding a trade before the season starts. With the Texans entering the 2014 season with journeyman backup Ryan Fitzpatrick under center, and a mostly aging offense around him, it’s easy to see why Johnson is frustrated. To be fair Fitzpatrick is probably better than the Matt Schaub / Case Keenum combination the Texans rolled out in 2013, but there’s little reason to expect an uptick in Johnson’s numbers either. If he sticks in Houston consider him a very high end WR2 but he has WR1 upside if he’s traded to the right situation. 15. Michael Floyd, Arizona Cardinals – After a so-so rookie year, Floyd burst on to the scene in 2013 with his first 1,000-yard season, out-performing his future hall of fame teammate Larry Fitzgerald. Floyd’s 16.0 yards per reception was 5th best among players targeted 100 times or more, but he’s much more than just a speed receiver. An already polished receiver coming out of college, Floyd is not afraid to catch passes across the middle or in traffic and can take a long touchdown down the sidelines as well. With another year in a pass heavy offense, there is a lot of reason to believe that we haven’t seen the best of what Floyd has to offer. I’m targeting him as my WR2 and am looking for another step forward in 2014. 16. Roddy White, Atlanta Falcons – There are a lot of fantasy owners and analysts who are already throwing dirt on Roddy’s grave and while he’s on the wrong side of the age curve at 32, I’m not ready to write him off just yet. White was never healthy last season, playing through a high ankle sprain that would have kept most other receivers on the sidelines. While some are slapping the injury prone label on him, White never missed a game until last season. White plays in a great offense and had narrowly missed having 3 straight 1,300-yard seasons before that (he missed by 4 yds in 2011). White is being drafted 28th amongst receivers and if that holds he’ll come as a huge value this season and I’ll be owning him on a lot of my teams. 17. Michael Crabtree, San Francisco 49ers – Crabtree finally lived up to his potential in 2012 and was a borderline WR1 in fantasy, but in 2013 a pre-season achilles injury cost him 11 games. When he returned he was clearly not himself, scoring just one touchdown, and topping 70 yards only once. With another off-season to recover, Crabtree should return to form and get back to being Colin Kaepernick’s favorite target. The 49ers are looking to open up the playbook and pass more often (they were last in attempts in 2013 with 417) which will help pad Crabtree’s stats as well. When healthy, Crabtree is a very solid WR2 with WR1 upside. 18. Victor Cruz, New York Giants – Cruz is a frustrating player to own, not because he isn’t a great receiver – he is – but because Eli Manning can be so damn bad at times. In 2013 Cruz posted 10 or less fantasy points in 7 of 14 games. In 2012 he did that four times, including fantasy playoff weeks 15 and 16. The Giants are moving to a west coast, short passing offense in 2014, and while that should be a good fit for both Cruz and Eli, but it’s tough to trust Eli enough to spend an early pick on any of his receivers. Consider him a mid-range WR2 with WR1 upside if Eli bounces back. 19. Torrey Smith, Baltimore Ravens – With tight end Dennis Pitta injured in training camp, Joe Flacco had no choice but to target Smith early and often and Smith’s numbers showed it, posting career highs in receptions and yards. The one knock on Smith was his inability to find the end zone, finishing with just four touchdowns last season. This year the Ravens offense should be improved with a healthy Dennis Pitta and the addition of veteran Steve Smith, which should help prevent defenses from focusing completely on Torrey. As with any speed receiver, Smith can be frustrating from week to week, but he has WR1 upside if everything breaks right and is currently being drafted as only the 25th receiver off the board. 20. Cordarrelle Patterson, Minnesota Vikings – There is a lot to like about Patterson coming in to 2014. He’s A special athlete who has elite tools and can do incredible things on the football field. Add to that Norv Turner who has a long history of making receivers into superstars and it looks like Patterson is a fantasy jackpot. So what’s the problem? Every fantasy analyst under the sun has Patterson on their sleeper list, which makes him anything but a sleeper. It’s July and Patterson is being drafted 13th overall amongst receivers… Slow. Your. Roll. If you want him on your team you’ll need to pony up a late third round pick, and as much as I love the kid, that’s an insane level of risk. If you’re a gambler, here’s your guy, but I’ll take someone much safer at that spot instead. 21. Percy Harvin, Seattle Seahawks – When he plays Harvin is one of the most explosive players in the league. The last time he was truly healthy he was the highest scoring receiver in fantasy (weeks 1-8 of 2012) but there always seems to be something with this guy, whether it’s migraines, ribs, hamstrings, ankles, or last year’s hip injury and concussions… his medical chart is massive. Harvin is in a good situation in Seattle with a talented young quarterback and creative play callers, but it’s really hard to trust him to stay on the field. His current ADP has him being drafted in the mid third round, which all but guarantees he won’t be on my teams this season. If he can find a way to play all 16 he could be elite, but I wouldn’t bet money on that happening. 22. Larry Fitzgerald, Arizona Cardinals – After a near 50% drop in yards from 2011 to 2012 many fantasy owners blamed the Cards horrible quarterback situation for Fitzgerald’s drop. Last year the team brought in Carson Palmer (a HUGE upgrade over the garbage they had in 2012) and a pass happy head coach in Bruce Arians, yet Fitz numbers were still subpar, leaving many (including me) concerned that his best years are behind him. Fitz is still a good receiver and there is a good chance he returns to his career norms, especially with another year in the offense but if I had to choose a Cards receiver to have on my team I’d rather have Michael Floyd instead. Draft Fitz as a WR2, but he’ll probably get drafted much earlier than where I have him ranked. 23. Mike Wallace, Miami Dolphins – After a disappointing first season in south Florida, expectations are high for Wallace with the new up-tempo “Chip Kelly Jr.” offense that OC Bill Lazor is installing. Last season Wallace’s usage was incredibly predictable (all but 44 yards of his production happened on the right side of the field) making it easy for defenses to shut him down. This year, Wallace will be moved around often, creating mismatches and allowing him to use his blazing speed, and we all know what he’s capable of when he gets separation. Generally speaking I find it hard to trust speed receivers because of their boom or bust productivity, but like DeSean Jackson last year this offense can do special things, even if it’s the poor man’s version. Draft him as a risk / reward WR2 and hope he puts it all together. 24. Wes Welker, Denver Broncos – Through the first 8 weeks of the season Welker trailed only Calvin in fantasy points, but two concussions in a four game span shut that down in a hurry. The league is hyper-sensitive about concussion issues (rightfully so) and when a player gets two in such a short time I run the other way, and quickly. Welker is a great receiver, plays in an incredible offense and has one of the best quarterbacks of all time throwing him the ball so when he plays, he’s outstanding but he’s a riskier pick than many assume. If Welker falls to me a reasonable price I’ll gladly draft him, but he’s one more shot to the head away from his season ending (or retirement) so be warned. As long as he’s on the field he’s a low end WR1, or high end WR2, but odds are he’ll probably get drafted before I’m willing to pull the trigger. 25. DeSean Jackson, Washington Redskins – Jackson had a career year in 2013, finishing ninth in the NFL in receiving yards (1,332) along with nine touchdowns. Unfortunately, his troublemaking both on and off the field led the Eagles to dump him for nothing. Shortly after his release D-Jax was scooped up by the Redskins and now gives RGIII another explosive target along side Pierre Garcon. While I do believe the Redskins offense will take a big step forward in 2014, I attribute a lot of D-Jax numbers to Chip Kelly’s fast paced offense so I wouldn’t expect a repeat. That’s not to say he won’t be a fantasy relevant receiver in Washington, but his week-to-week volatility can either win or lose you a week’s matchup. He’s a WR2 in fantasy, but at his draft cost, I would rather have someone more consistent. Continue to part two of our wide receiver rankings for 26 through 50. Yea with Welker it’s tricky because he’s so talented, and of course Peyton, but concussions really scare the heck out of me. Right now he’s going in the early 5th according to MyFantasyLeague ADP… that’s way too high for the risk that comes with him. For me to draft him he’d probably have to be more in the 8th round but it’ll never happen because someone will take him way before I do.